All of our At-Home Programs are delivered through our own Soccer Fitness Gols moible fitness app, available now through Google Play for Android phones and the Apple Store for iPhones. 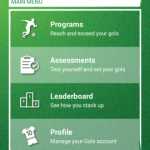 Soccer Fitness Gols is the first mobile app offering customized fitness programs built on soccer-specific sports science that fits easily into your hectic lifestyle. Our programs are designed to improve the critical components of soccer fitness, such as strength, power, endurance, speed, and flexibility. We are leveraging over 15 years of experience working with soccer players to ensure our programs not only deliver results, but are also challenging and fun. Training like a soccer player also greatly improves cardiovascular health, and can significantly reduce the risk of developing chronic diseases. Our programs are customized to your level of fitness. 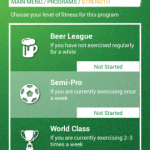 When you download a program, the first step is to complete a fitness assessment. We use the basic functionality of your smarthphone, such as GPS, to run the assessment. Based on your results, we develop a program with specific exercises and targets just for you. As you progress through the program, you will complete periodic assessments to track your progress. As your level of fitness improves, the workouts get more challenging. Whenever you complete an assessment, whether at the start, middle, or end of a program, we allow you to compare your results with your peers according to your age and gender. Over time, you can chart your progress across the various components of fitness, and select programs to target the components you want to improve. All of our programs are made up of two workouts per week, and each workout is designed to take approximately 30 minutes to complete. Our programs can easily fit into even the most hectic schedules. 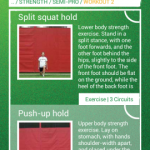 Click HERE to download Soccer Fitness Gols today! Contact Soccer Fitness to learn more about Soccer Fitness Gols.